In the business world, there are two buzzwords on everyone’s lips at the moment – ‘digital transformation’. In the last 10 years, everything has changed. We have all been disrupted by the digital revolution in good ways and bad. Now, everyone from the bottom to the top of an organisation understands… to some degree at least, that digital transformation is an essential business survival strategy going forward. Digital transformation isn’t just launching an app or taking your CRMs online. Digital transformation involves integrating digital technology throughout your business to fundamentally change how you deliver your service. How this looks in reality, will be different for every business, but the overarching aim is to leverage the opportunities that new digital technologies offer, to deliver value to customers, employees, suppliers, and stakeholders. With that in mind, we asked some of our clever digital savvy candidates to offer some tips for an effective digital transformation. What needs to change will be different for every business, and every business in today’s digital world will face new challenges and expectations. Digital native customers expect a seamless experience, and competitors are either delivering more for less, or entirely disrupting the way services are delivered. Whichever way you turn, there are threats and opportunities, but without change, it’s only a matter of time before your business gets left behind. As a starting point, it’s important to understand your specific market from the customer’s perspective. What are their needs? How do they want to interact with your products or services? How can technology help to deliver value for them? How can you make fundamental changes to your business that will deliver a seamless approach for your customers? How can digital changes improve what you offer? Without great leadership, change is but a dream. Digital transformation is such a fundamental change in the way you do business, that it has to be driven from the top down. Without digitally competent leaders, your company won’t have the necessary understanding to make informed choices about technology and where to focus their efforts. This doesn’t mean that leaders need to be digital experts, but they do need to recognise the value in technology, to be driven to actively assess their knowledge gaps, and seek out the information they need to make transformative choices. Not only do leaders need to recognise the need for digital transformation in their business, they also need to be able to make the right choices, and inspire the workforce to embrace the changes to come. Whilst change may be exciting, it can also be daunting, and people react to change in very different ways. 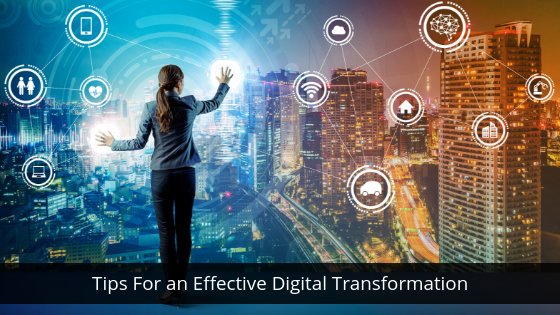 If leaders are digitally competent, they can confidently explain the benefits of digital transformation; a must, if your transformation project is to be successful. Of course the customer must come first, that is where you as a company derive meaning. For digital transformation to be successful, you have to look at change from the point of view of the customer. What do your customers actually need? How do they want to interact with your company? Customers want you to make their interactions easier and more efficient. To make this a reality, you’ll need to understand their pain points and work out how you can address them. Make it your mission to map out every aspect of your customer’s journey and identify what can be improved. Only once you understand the problems and opportunities for improvement, can you start to look at digital solutions. “If you can’t measure it, you can’t improve it”. Whilst the veracity of this statement may not be completely true, it does help to illustrate the importance of a data-driven approach. Yes, gut instinct is an essential quality, but it is data that truly tells you what is working and what isn’t. Admittedly, in this day and age, it is easy to drown in the reams of data available to us, but the key to success is to work out what needs to be measured, and use that data to drive your digital transformation forward. Digital transformation is ongoing; it will go through countless iterations, and without the necessary data-driven approach, success will be hard to come by. Whilst digital is undoubtedly the ‘shiny new vehicle’ for change, it’s important to remember that transformation is nothing new, and the goal is still the same – to deliver value and to drive the change that your business demands. Leaders have been rethinking, redesigning, and re-engineering businesses since time immemorial, and by doing so, have been able to meet the changing needs of their customers and the markets they operate in.